Time to Change is for you. This poem was inspired by the career journeys of “Purpose Seekers”. Most of you think that you suffer in silence. But I see the end to end journey you go through (when you work with me). I feel the warm wind that carries the early droplets of the storm. I witness your frustrations, the dead-ends, the tears and victories. I see old empires that have been established in your hearts and minds melting down by the realisations and truths you discover within you. You fight against your ghosts and demons from the past. The change is hard but you are more than ready. You know this moment very well. It is when you surrender to the force within you, that magic happens. On this path of freedom – you thrive! HAIKU is a Japanese form of poetry that describes a fleeting moment in time. If you are not fully present, it may surpass you and you may never grasp it back. In this way, HAIKU makes the ephemeral, eternal. Haiku poems heighten our senses and are characterised by an antithesis. Each verse follows a 5-7-5 syllable rhythm. HAIKU was often visually represented as calligraphy in traditional Japanese Tea ceremonies. These verses used to verbally depict nature in all its glory. Here, I chose a contemporary experience from human nature that you have all gifted me. Now, I would love to hear your comments. 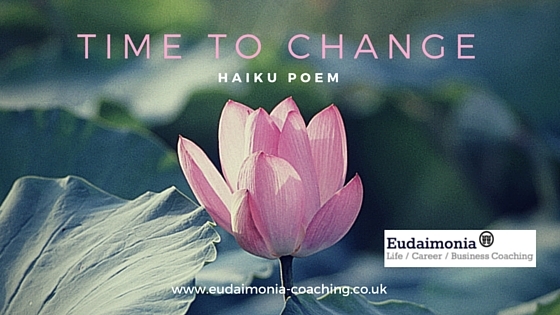 Or… Why not have a go at creating a HAIKU verse or two of your very own career journey and share it below. Christina, so thoughtful and true. The sense of aloneness in one’s struggle, can be so hard to reconcile. Beautiful haiku. Thank you Marina for your powerful reflection! Thank you for the haiku. I have read it many times now and every time it reveals a bit more and I really like it. Thank you Magda for your comment! I am looking forward to hearing what it revealed to you next time we meet!